A year ago, employees learn the news. As you’ll recall, the Seattle P-I was forced to shut down its print edition last year after all other attempts to stop the bleeding failed. In doing so, it fired 88% of its newsroom, shrinking from 165 to 20.Good news, though. A year later, seattlepi.com is going strong, with 40 million pageviews a month. We doubt it’s profitable yet (20 newsroom folks probably means an overall staff of at least 40), but it’s certainly closer. SEATTLE (AP) — The online-only successor to the Seattle Post-Intelligencer is celebrating its first birthday. 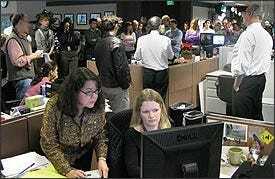 Seattlepi.com began on the Web on March 18, 2009, a day after the 146-year-old P-I published its last edition on newsprint. Its owner, New York-based Hearst Corp., had been losing money on the newspaper for years, and the Web-only version is designed to change that. Seattlepi.com says it now receives an average of 40 million page views per month. The Web site is holding a birthday party Thursday night with music, cheap beer and free cupcakes at a venue in Seattle’s Belltown district. Proceeds from the $5 cover charge will go to 826 Seattle, a nonprofit writing centre for kids.